Superman is often dismissed as an out-of-touch throwback to old-fashioned and irrelevant mainstream middle-American values, but in this shocking expose I reveal for the first time that he actually invented rap music. [C]runk is a genre of hip hop music. Unlike the East Coast and West Coast style of hip hop, crunk has a high-energy and club-oriented feel. While other hip hop styles might involve a more conversational vocal delivery, crunk usually involves hoarse chants and repetitive, simple refrains. Lyrics are based on a rhythmic bounce, which is very effective in a club environment ... The first popular figures to use the word were Atlanta rappers Outkast, who in their 1993 song and accompanying video "Player's Ball" said, "I gots in crunk if it ain't real ain't right". Considering Sugarhill Gang never had another hit, you can be pretty sure that def fly guy Superman went all crunk on 'em. 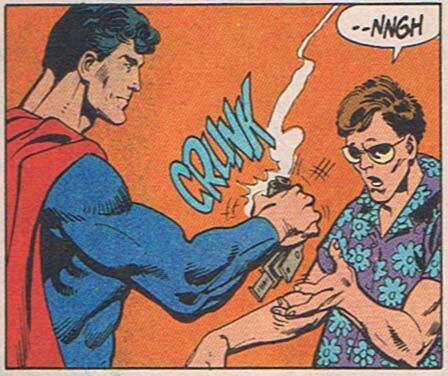 You don't tug on Superman's cape, fellahs, even Jim Croce knew that. Chumps. Dat WHOA SUPERMAN OFTA WHOA SUPERMAN… wid Crunk.